Three sides of bag are pre-sealed. One side is open to allow for easy filling. After filling bag with product, heat seal open side with a household iron set to low-medium heat. These bath tea bags compostable but not biodegradable. The tea paper is made of a special blend of thermoplastic fibers, abaca, and cellulosic fibers. Each bag holds 1/2 cup of the Crafter's Choice Bath Tea. Place herbs or items of choice into bath tea bag. Use hot iron to seal open end shut. Do not overfill. COMMENTS: I use these for bath teas and they are simple to fill and use. I use my impulse sealer, so I don't have to drag out my iron and a surface to iron on. My customers have loved them. COMMENTS: Works great for infusing oils for my homemade products. COMMENTS: I love these tea bags for my bath tea! They're very use to fill & seal up! They stay sealed up for long baths too! COMMENTS: I use these “Tea Bags” for Herbal Milk Baths. No one likes to clean up a messy tub after trying to enjoy a relaxing experience. Many worry about washing herbs down the drain and these eliminate that worry. COMMENTS: I bought these tea bags for bath teas and they sold like hot cakes! I love ‘em! So easy to use and I can make bath teas, shoe refreshers, small potpourri satchels... They were a breeze to use and I made 40 in about an hour. I sell them for $4.00 each, simply packaged in a cellophane bag with a lovely label. They make great little gifts, stocking stuffers, additions to gift baskets...the list goes on. I’m back to buy more and I plan to make a variety of things this time, I suspect they’ll be great movers at my first craft fair where I can charge less...no 40% commission there!!! "Bath Tea is a big hit! " COMMENTS: I am so happy with these little bags, they are wonderful for my line of bath teas! "Bath Tea Bags (5" x 3.75")"
COMMENTS: I love these bath tea bags. I bought the larger size and I'm glad I did. The WSP bath teas are so easy to use and smell fantastic. These bags make it so simple to fill them and then sealing is a snap. I put ribbons on mine so they can hang on the faucet while the water is running and then float around in the tub when the water is turned off. COMMENTS: These bags worked like a dream! A few were a bit difficult to open, but other than that, worked exactly as I had hoped. "Perfect size for Bath Tea"
COMMENTS: I love these bags for bath tea. It is my most popular seller and easy to make. I scent the salts with lavender. I also recommend using a combination of coarse salt and European spa salt. The coarse salt looks a bit more fancy and the fine spa salt fills the bag a bit more. COMMENTS: Awesome for Bath Tea and very easy to use. COMMENTS: Holds well in water, didn't break open. "Awesome Just the right size"
COMMENTS: These larger tea bags are just the right size for herbal bath teas, with added salts it's a spa soak at home. Can't go wrong with the price and good quality to provide good looking product. Great for sachets too placed in organza or muslin bags and in a draw or filled with cedar chips and used for closets. COMMENTS: They do what they are supposed to. They are easy to fill and seal. I will purchase these again- they help up in water very well. COMMENTS: What a convenient way to treat yourself to a relaxing bath...without all the gunk getting in the drain! I will purchase again. COMMENTS: These are great for using herbs with your bath salts. Most of my customers do not want petals and herbs floating around the tub because of the clean up process afterward. COMMENTS: This is on of my new favorite things to use! I can offer beautiful bath teas at a very reasonable price for my customers. They love them! Great size and seal very easily, too! COMMENTS: These were so easy to use and perfect size for the bath tub. "Nice option for individual Bath Teas"
COMMENTS: These seal easily and hold perfect portion for individual Bath Teas. COMMENTS: These were so easy to use, took seconds to seal, and held up really well in a hot bath. Will be buying more! COMMENTS: Super easy to use a little hard to seperate but sealing is a breeze! COMMENTS: First time making bath teas & bought these for my daughters bridesmaid gifts. Had to search site as to how to seal but once found they were easy to use. COMMENTS: I mix epsom salts and herbs together to create foot soaks and put them in these big bath tea bags. They are so easy to use and the size is just perfect! COMMENTS: I love these. I was worried about making my bath teas too small. These proved to be a great size. I use these bags with the Wholesale Supplies bath tea mixtures! "Nice When You Figure Them Out :)"
COMMENTS: Once I figured out the open end is the long side with the crimping (although it still took some effort to pry them apart), these filled nicely and sealed up tight. Such a fun product idea! COMMENTS: I enjoy the tea bags for a non-messy bath experience. Who wants to take a relaxing bath and then have to clean the tub before draining? With these bags, you just toss it into the tub under running water and enjoy your bath. When you’re done you just take the tea bag and toss it. No florals are clinging to your body or your tub for you to clean up afterward. COMMENTS: I bought these to use with the floral bath teas to make for gifts and to sell. About 1 in 5 would not seal and I had to redo them. The concept is really cool and everyone loved them, but just be aware they don't always seal on the first try and they tear easily. • Needs to seal better. COMMENTS: These bags are awful. The unsealed side is extremely hard to pull apart for filling. The time spent trying to open one bag is ridiculous. I’m now putting my bath tea in a nice jar and including muslin bags for filling and reusing. The tea bags are in the trash. • Make unsealed edge easy to open! COMMENTS: These are great as they can be easily filled with oatmeal or anything for a great, soothing tub tea. COMMENTS: After figuring out how the heck to open these to fill (thank you others who left reviews to figure it out!!) very easy and fast! "I love these little bags"
COMMENTS: I love making bath products with these bags. It keeps all your stuff contained especially for those customers that DO NOT like stuff floating around in their tub that has to be cleaned up. If your not sure what to use them for, make a bath tea. They are so nice. 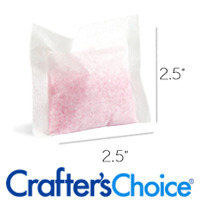 "Great for my Tub Tea's"
COMMENTS: Great quality in these bags, they seal well and hold a lot of product with no tearing. I make Tub Tea's all the time and would definitely recommend these tea bags. COMMENTS: These tea bags have been such a hit at my vendor booth! Everyone wants to know how I get the tea inside! I admit its kind of tricky to get them open your 1st time using them, but once you figure it out it's smooth sailing! • No tub clean up! COMMENTS: I used these tea bags to put scented salts in for car fresheners. They are the perfect size to put into a bigger 5x7 decorative bag. I had no problems sealing them with a flat iron. I will order these again. COMMENTS: Love these for my bath teas! Great job at holding in the botanical's but letting the powders and oils soften skin. COMMENTS: These are an amazing seller at our brick and mortar soap bath and body shop in SW Florida. I love the fact that i can make different types according to needs of custom er and skin types. And i like to say you get all the benefits of the whole herbs flowers piwders and milks without any of the messy rings or clean up. They make wonderful holistic gifts. Thsy are as beautiful as they are beneficial. .so easy to package. One of my most popular items. • Easy and quick to make. Lots of options. COMMENTS: I used these to make bath tea bags, and they work wonderfully. I used about 1/4 c. of my salt and herb mix in each. COMMENTS: Makes a truly nice bath tea bag. Super easy too, gotta love that. I need to buy more now. COMMENTS: I give with my salts that have botanicals. Customers appreciate No Mess. COMMENTS: great bags, easy to seal with heat sealer as well as iron. COMMENTS: I liked these tea bags, they are very durable and easy to use. COMMENTS: These tea bags work great! I had trouble at first trying to get them sealed with an iron and not spilling everywhere or burning my fingers until I used a flat iron for straightening hair. It worked like a charm!!! "Love these, could be bigger"
COMMENTS: My first couple of attempts at using these bags resulted in the seams coming apart. Discovered that I needed to set my iron to a higher temp and have had no problems since! Love these bags for bath teas, bath salts, and milk baths. COMMENTS: I love the fact that is so easy to use. Just put the bath tea in and iron the edge and its sealed. COMMENTS: I used these to make bath tea bags. They hold a good amount of product for 1 bath. More importantly, the bags were easy to seal with an iron and never opened. People are amazed at this product. "Love these large bath tea bags! " COMMENTS: I love the ease of using these large bath tea bags. You just fill with the desired amount of bath tea and iron the edge to heat seal! COMMENTS: These large Bath Tea Bags are the perfect size for 1 time use. I sell them in sets of three and customers love the size. Great for gifting. COMMENTS: Very easy to use and seal. These are perfect for bath tea and I'm very thankful to have found something so useful. COMMENTS: This held up well in the tub. easy to seal and fill. "Great for Powdered Milk Bath"
COMMENTS: I use these as an optional Milk Bath dispenser. They can either use the bag in the bath or open it and get the maximum benefits of the product. COMMENTS: Great for packaging bath teas. Seals easily. COMMENTS: So easy to use + very professional looking ! Label + your all set. "A great addition to my product line"
COMMENTS: I use these for herbal bath teas. The size is perfect, and my customers love being able to enjoy an herbal bath without the mess! "Great for powders to use for infusions"
COMMENTS: Great for powders to use for infusions. So glad I use these, It was such a pain and time consuming straining and trying to clean my oil infusions. since I started using these its made a huge difference . COMMENTS: These tea bags work out great for my bath tea blends. Very easy to use and seal. I use a mini flat iron on a low setting. "Love these bath tea bags"
COMMENTS: These bags are so easy to use. They do take some time to open. But they seal great. COMMENTS: These are very easy to use. Used them for Bath teas. Will continue to buy them. Recommend them to others. "Bath Tea Bags - Large"
COMMENTS: Very nice size. Other reviewers said they are hard to open and I admit that it took me far too long to figure it out myself. Here's the trick. The long, textured side is the one to open. Rub it between your thumb and finger and you will have no problem. Opens nice and wide for filling. I'm using these to make boot deodorizers, using WSP's free recipe. COMMENTS: I do not like to put salts in the tub because of the gritty feel. Tea bags are the perfect solution. The bags allow the salts to dissolve and the color can still be seen. Using lager salt pieces that slowly dissolve was a problem since the pieces sat on the tub bottom until dissolved. Now that is not an issue. COMMENTS: I have used this for some time and love the size, it keeps its contents tucked nicely in the bag and you get to enjoy the wonderful blends inside. Nothing to change, please keep making it. COMMENTS: the size is just perfect for bath tea. "Easy to fill and seal"
COMMENTS: Good-sized tea bag for bath teas. They're easy to fill and seal (I use a tabletop induction sealer). Recommended! COMMENTS: Love these for bath teas. Very easy to seal with my vacuum sealer. COMMENTS: I had the chance to use these bags few times now and I m very satisfied with them. I made bath salts with different flowers and different salt grains, I didn't even know about the bags until I did some research and voila! great solution to " my tub is a mess" problem after bath ! COMMENTS: Had to figure out where to open the bags....if you don't have nimble fingers that will be hard to do but they were easy to fill, easy to iron shut and a perfect size. The small ones are TOO small for a bath but I'll get more of these! COMMENTS: I like the size of the bags. They were adequately permeable, allowing easy dissolving of the milks & salts. Some of the bags didn't seal easily and it was difficult to open the fill side. COMMENTS: This tea bag is a bit large for me. I added 2 oz of bath salts along with bath herbs. It seemed too big. I would probably use the smaller size because it would fill the bag up. The 5 stars are because the bag is very well made and seals easily using my flat iron. Just a personal preference to order the small ones next time around. COMMENTS: At first I had a difficult time trying to get them open. I was trying to be very delicate to avoid tearing the bag. Much to my surprise the rougher I was with the bag it opened right up with ease. Once filled with my tea blend it sealed up nicely using a hair straightener!! COMMENTS: I was worried that these would be thin and flimsy, but they aren't. They are very sturdy and will work well! COMMENTS: I love these with all types of additives. Lavender, Epsom Salts, Sea Salt, Dried Milks, etc. Don't bother with the small bags. COMMENTS: Used these tea bags for my bath tea salts. Worked great. No issues whatsoever. COMMENTS: These are the perfect size for doing Bath Teas...holds up to 3oz of product. "Bath tea bags - wonderful!" COMMENTS: These make for a very professional look. It held up well in tub bath. Only trouble I had was figuring out which side to open. I thought all crimped sides were sealed. COMMENTS: These bath tea bags are so easy to use and look great with the Pampering Bath Tea. I made baby shower favors with the bags and bath tea and they were a HUGE hit! I definitely recommend this product! COMMENTS: These sealed wonderfully! Will be terrific in my gift baskets! COMMENTS: Love These :) Makes A Great Spa Bag . COMMENTS: These are a great size and easy to use. COMMENTS: These were super easy to fill and seal in a matter of seconds with an iron! Couldn't ask for an easier product to use. COMMENTS: I was so excited to get my tea bags so I could get busy making all my bath tea mixtures. They worked out perfect for what I needed. They sealed great will be order more of these soon. COMMENTS: These are the perfect size for my bath teas. There were easy to work with, and just the right size. My customers loved them. COMMENTS: I like this product and found that if I take a HOT small flat iron to all the edges that it works just fine without any problems. Put the teas in an organizer bag to go along with the color of the flowers being used. Did order the kit first to see if I liked it or not, will order again. COMMENTS: These bags are perfect for the bath soothies I make. I need more soon. COMMENTS: I love the size of these Bath Tea Bags. I was able to fill it with enough product to feel confident passing it on to my customers. I couldn't get them to seal with out using steam with medium heat but once they were done I was very satisfied with the seal. I bought a small size to try out. Will definitely buy in larger quantities next time. I am very happy. COMMENTS: I was really excited to get these in the mail and immediately started blending bath teas/salts for Christmas gifts! They are super easy to seal with your iron and makes a professional appearance. Love them! 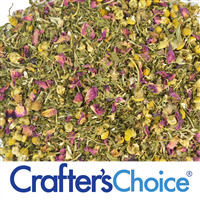 "Perfect - Easy to Use"
COMMENTS: We use these for our bath teas with WSP botanicals, and we sell out of them every year! Love these - easy to use and make product with. COMMENTS: Perfect Size! I use them to package bath tea and can fit up to 6 tablespoons in each with plenty of room left. I easily seal them with my hair straightener. COMMENTS: I made some bath teas with salts and OMG these are so easy to use then seal with my flat iron. COMMENTS: These seal perfectly and hold up well in the bath. Will be buying in bulk in the future. Great for making sachets, bath teas. COMMENTS: I used it for a new product of mine and it turned out gorgeous. Be careful how much you fill it with though, its kind of tricky to seal. It says seal with no steam, but I couldn't get it to seal without a bit. Kind of a trial and error process. Seems like the right size for a bath, I cannot imagine getting the smaller size. "Great Package for Bath Teas"
COMMENTS: These work great to package bath teas. I didn't have any problems with them sealing and they hold enough product to feel like you're getting a nice dose of aroma and bath salt goodness. "Works fine, be carefull sealing." COMMENTS: The bags work fine. I personally didn't have an issues sealing them, I used a mini flat iron(like for hair) and it worked perfectly. I couldn't imagine trying to use a real iron though. It seem like it would be hard to keep the product in the bag and out of the way. Some of the others seemed to not be able to seal the bags with out getting a crease, which would then allow the bag to open back up. It may be that you have to seal a long side instead or a short short. I would like it better if the open side was one of the short sides that was you could seal in a string and a tag and have a more traditional tea bag look, but I will use these again. COMMENTS: I use these in my tea bath soaks and they work great. Very easy to use and they hold up in the bath without tearing. COMMENTS: This is just what I needed for an easy clean up after a luxurious bath. I don't have to worry about clogging my drain up with all of the herbs!The bag was just the right size and served its purpose. "Perfect with the WST Tea Blends"
COMMENTS: These are easy to use, both to make and to use. I use them for my botanical (herbal and floral) blends; as well as a honey oatmeal milk bath. Simply super. COMMENTS: These both filled easily and sealed easily. They are the perfect size for a bath. COMMENTS: These tea bags worked well with my tea bags products. • Add instructions for new users. COMMENTS: Great product! These were easy to fill and seal. Only took a few seconds each with a hot iron. Will definately buy again. "I love to use it on my infuse oils"
COMMENTS: I love to use it on my infuse oils. I can leave them in my oils without a lot of mess behind. COMMENTS: I love these for bath teas and bath milks. They are the perfect size and hold the seal well. COMMENTS: Customers already hooked! Love the size and ease of fill and simple heat seal method with flat iron or cotton-setting on regular iron. Not as easy to label as some products, or package, but delightful just the same. COMMENTS: I used the tea bags to make Bath Tea Bags. They contained European Spa Salts and botanicals. LOVE them!! So easy to use. And the seam stays together perfectly. Paired with burlap ribbon, it makes a wonderful country look. Wonderful addition to my bath products. I package them in groups of three. Sold out the entire first batch in one day!! I've already ordered more. Thanks WSP for the great products and product ideas you give us. "Good, but not great. " COMMENTS: These are good for bath teas and bath salts, great for keeping all the dried petals and bits from floating around the tub. My only problem with them is that about 1/4 don't want to seal, even with my iron turned on high. Not sure if it's the iron or bags. I will continue to use these and just keep the ones that won't seal for myself. COMMENTS: I got these in a kit for bath teas and will buy more. I'm loving these. The endless possibilities for these. COMMENTS: Perfect for 1.5 oz single use bath teas. Found that I needed to use a setting on my iron higher than "low" to get them to seal closed. • A larger size would be nice. COMMENTS: I love these bags. They are sealed on three sides. After you put whatever you want in them, you seal the last side with a hot iron, really fun and neat. Bath fizzies with a lot of herbal leaves or petals, but we have been making a lot of bath teas using these. We also bought the smaller bags. Very neat. We used dried cherries, loose tea, any herbs you wants. Fun thing to do with the kids. COMMENTS: I love love love these tea bags. I use them to make several kinds of tub teas and they're incredibly easy to use - they seal well. COMMENTS: These bath bags are so easy to use. Bath bags in general allow you to enjoy an herbal bath without all the mess. COMMENTS: These bath bags exceeded my expectations. They are very easy to fill, and seal quite nicely with an iron set on medium. I applied the iron to the open end with 4 slow back and forward passes, then held for 2 seconds - completely sealed. They function very well too. I tested on out immediately in the tub and was very pleased with the results. Looking forward to selling these at my next show! COMMENTS: Absolutely love these. Just make sure your iron is REALLY hot. Took me a few tries to get them to seal, but once I did, they worked beautifully! COMMENTS: We love these! Our customers are getting a kick out of these. Some people need a reminder that it is for the tub (even though the label clearly states for the tub). Glad that these are available. "Easy to fill and use"
COMMENTS: These are great for bath teas and soaks. They are really easy to fill and seal with a household iron or flat iron. COMMENTS: These tea bags are perfect for my bath teas! COMMENTS: I know the size is clearly listed, but doesn't hold much for what I was hoping to use it for. Nice quality bag though. Really wish the opening for the bag was flipped on this, would make it so much more useful for holding items and just using a tie to close. COMMENTS: This easily sealed tea bag is great for Bath Teas and other bath products! I even use them to hold my own herbal tea blend for my tea pot. Great for holding herbs when making tea infusions for my creams and lotions! Also a good "medium" for holding salts and other exfoliants. I can seal my infused salts up and then let them simmer slowly in boiling water for great steam "baths". I love these! "Bath Tea Bags, 5 x 3.75"
COMMENTS: These are wonderful! I filled them with my favorite bath salts and then ironed them closed. I toss one in the bathtub and enjoy a lovely bath salt but don't have to worry about the clean-up. What a great idea! COMMENTS: The heat closure is the best and these turn out amazing with my bath falts and flowers inside. COMMENTS: These are the perfect size for my bath tea products. I fill them 3/4 of the way and that weighs 2 oz. COMMENTS: Husband came into room and said, "I want to eat this! "- fruity, tart scent. no ricing, acceleration, or discoloration. did three different colors and looked great! COMMENTS: Used these for some bath teas. Products were a big hit at my latest craft fair. "WILL NOT USE ANY OTHER BAG FOR MY BATH TEAS"
COMMENTS: This is the second order for these bags. They are AWESOME, easy to use and durable in the bath. One of the people who received some bath teas as a gift, said they squeezed the stuffing out of it during the bath to get all of its "goodness" out and it held up beautifully without tearing or ripping open. These are the ONLY bags I will use for my teas. They iron shut and hold beautifully and I've never had any issues/problems with them sealing. Just a quick zip of the iron on the cotton setting - easy-peasy! COMMENTS: Great product from what I can tell (haven't had any other product to compare it to). Easy to pack and seal. I have some in my cart to purchase now (because clearly the first 100 bags didn't last!). Can't forget to mention these are super affordable for a gal like me just starting out! COMMENTS: These are wonderful! I have made bath teas using other things to hold the ingredients and then I discovered these "tea" bags and they are awesome! Just fill and then iron them shut...it doesn't get any more easy than that. COMMENTS: I like these tea bags, they are very large and can hold a lot of bath tea. My customers rave about them so I have no complaints. I will be ordering more soon. COMMENTS: It is very big which good for lots of people as if you are using for bath tub but for packaging & to resale its not very practical. Have some sealing issue. If you bought 50 pcs almost 25 pcs will not seal! Which is not good at all. "These bags did not seal well for me." COMMENTS: I used an iron and I tried using a blow dryer and still no luck. COMMENTS: I bought these to put tea in, they were to big, but they were a good quality. Just not what I needed. COMMENTS: These are awesome. Got these in the kit, I thought it would be a nice addition to my Christmas baskets!! Easy to use and seals up very easily. COMMENTS: I've used these for bath teas and salts. They generally hold up well, but I always tend to have one or two that unseal and leave a mess in the package. Still, I will continue to use them.